Discussion in 'Industry News' started by 30hz, Feb 12, 2019. Hi there ! can someone please explain to me what's going to happen? It's coming in the future. I am very excited about MIDI 2.0, specially in regards to the jaw-dropping 32-bit resolution, which means 4,294,967,296 different velocity values (I'm not kidding). My main concern is the CPU usage for samplers using this technology, if with 7-bit resolution (127 velocity values), sometimes our CPUs struggle with multiple Kontakt instances, what about 32-bit? There better be some godamn revolutionary optimization in MIDI 2.0. Member companies are currently working together to develop prototypes based on a jointly developed, feature-complete, draft specification. The is a members-only ‘plugfest’ planned for NAM 2019 to test compatibility between some early MIDI 2.0 prototypes. Participating companies include Ableton/Cycling '74, Art+Logic, Bome Software, Google, imitone, Native Instruments, Roland, ROLI, Steinberg, TouchKeys, and Yamaha. Having established the core features of MIDI 2.0 the 2 associations will be continuing to work with their member companies to to undertake the prototyping phase as well as the development of a MIDI 2.0 logo and self-certification program for MMA and AMEI member companies. The MIDI 2.0 initiative will update MIDI with auto-configuration, new DAW/web integrations, extended resolution, increased expressiveness, and tighter timing, all whilst maintaining a high priority on backward compatibility. 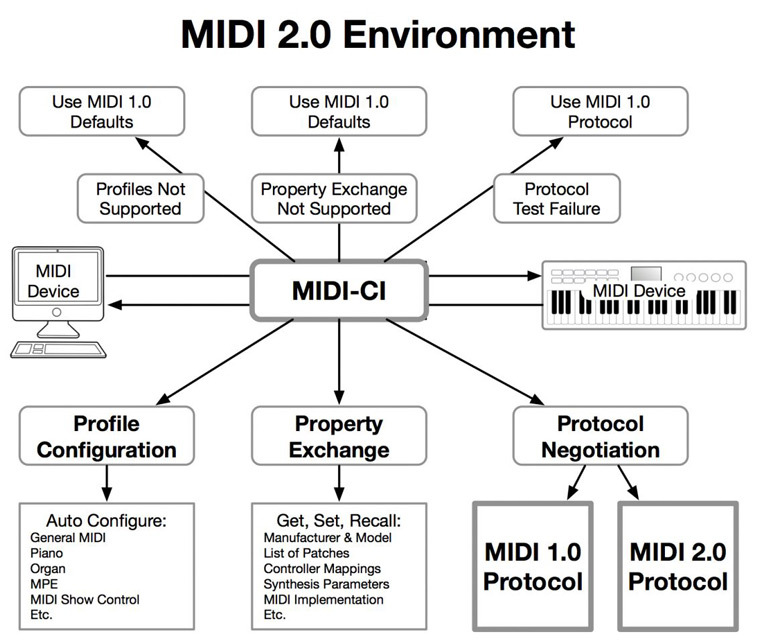 This major update of MIDI has been designed to pave the way for a new generation of advanced interconnected MIDI devices, while still preserving interoperability with the millions of existing MIDI 1.0 devices. One of the core goals of the MIDI 2.0 initiative is to also enhance the MIDI 1.0 feature set whenever possible. Is The MIDI 2.0 Spec Available? Spitfire will launch the same libraries with 4x the size and different names. 8dio too, multi-grammy awarded Trolls Foelman will suffer a cardiac arrest for signing too many pointless 8dio stuff and he'll leave us. Changed to "industry news" section. "Forum News" section is for information about this forum. I think MPE and higher than 7 bit resolution are already included. But we'll have to wait how they implement it in practice. I don't know how benefits it will bring to us computer musicians but I'm looking forward to. If you think about it, a jurassic (early 80s tops?) hardware protocol has brought us a lot of cool things. The modern MIDI v2 will logically have more in mind "soft only" possibilities, implicitly or explicitly. Haha I wonder though, do we really need that many velocity layers!? That's a big decision they are going to have to make whether or not they want to sacrifice that much space. Well, obviously I was joking, but there're things they might benefit of better resolution. It makes more sense in the case of a synth actually. You're generating the sounds so it's not a problem to generate whatever velocity value you want from it. In case the synth is velocity sensitive, that is. If you're using a hardware MIDI keyboard/surface you don't know what instrument/control you're playing. So it really matters to hardware developers too. And perhaps something we barely use as MIDI CC automation could really use more than velocity.. But even if we think in the most used MIDI controls, let's say Pitch Bend. For me it's enough to have only 128 values. But pitch bend has negative and positive values. That means that there's no "standard" zero value, which is important because it's the default one. So MIDI developers typically use either 63 or 64 for "zero value". 0 would mean full pitch bend down, 127 full pitch bend up. That matters to MIDI developers, because there's no standard for that, just the 64 (or 63) as a de-facto standard. A proper MIDI API should be able to tell the developer which value is the zero. If they decide to use a floating point value then there's no need. It was a hard choice to vote this "funny" or "agree"